WHAT’S NOT TO LIKE? Once derided as something real men don’t eat, quiche has never stopped being delicious. I like quiche, I don't care what they say—and what was it they said about quiche? Much has changed since a snarky scribe wrote the bestselling Real Men Don't Eat Quiche: A Guidebook to All That Is Truly Masculine in 1982. The dish became collateral damage against a backdrop of changing gender roles, the questioning of men's privilege in the workplace and a political swing to the right after a disoriented American public elected a strongman-type television personality who promised to bring back the nation's past glories. I know, it seems like a long time ago. But how's the quiche doing today? "I don't think the millennials know about that," the Girl & the Fig founder Sondra Bernstein says of the authenticity-driven male embargo. "We sell a ton of quiche—I don't think it's a gender thing anymore." As of December, the restaurant had sold an estimated 8,000 slices of their light and fluffy quiche in 2017. These days, few people who have heard of the don't-eat edict can identify its origin as the title of a satirical book that was, like much satire, mistaken for an instruction manual. Indeed, author Bruce Feirstein anticipated the objection that few men would refuse a helping of "cheese-and-egg pie," without the Gallic taint (quiche, née küche, actually comes from German cuisine, a sidekick to bratwurst and beer). It sure was lost in translation for French-born Alain Pisan. "I remember when my wife first told me about this expression," the chef recalls, "it made me laugh at the silliness of it. Fortunately, we haven't seen many men rebelling against quiche for the past two decades." 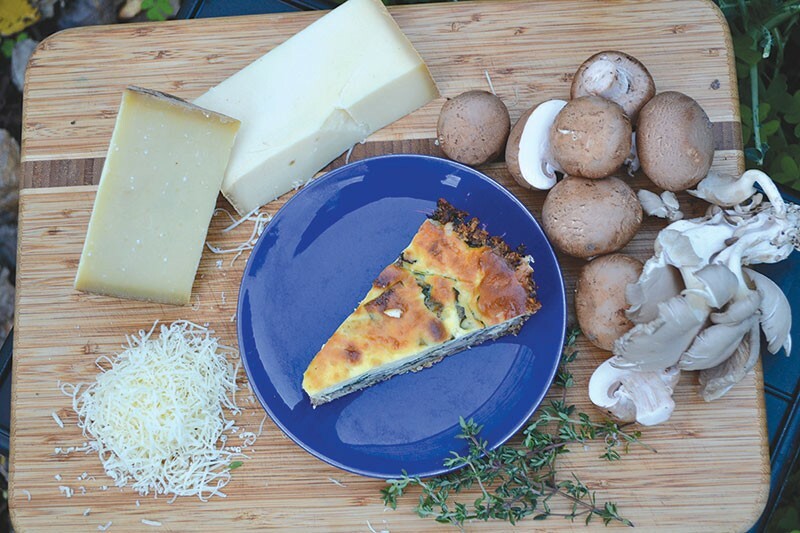 Quiche made from a family recipe was a popular item at Chloe's French Café, the Santa Rosa eatery that Pisan cofounded and closed due to the 2017 fires. "Its popularity continues with our catering operation," he says. Cheese educator Lynne Devereux reminds me that quiche got a bad rap during a reputedly health-conscious decade, when many women traded the quiche and salad brunch for, well, salad. "It's part of that fat phobia that reigned in the '80s," says Devereux. "It's glistening on the top because all the oils of the cheese have come to the top and made it all shiny. There's fat in the crust—there's fat in the filling! So it kind of became one of those 'bad' foods." That's all good for Jean-Charles Boisset, a red-blooded captain of industry. "I think quiche can be a textural, sensual, seductive experience," Boisset days. "And I love the word 'quiche,'" Boisset enthuses. "Your lips move forward—you could even kiss the wall, or your plate. I used to kiss my plate." OK—I should have said "red-sock-wearing," and clarified we're talking about the wine industry here. But Boisset, who is perhaps California's best-known Frenchman, knows of what he speaks, having fond memories of quiche and other season-to-table foods made by his mother and grandmother in Vougeot, Burgundy. Boisset recommends pairing quiche with a rich Chardonnay or Pinot Noir made with Gruyère or Emmental, then finished with French Comté cheese aged 18 months. "You do that, and you're gonna have an orgasmic experience," Boisset says.